Bliss Villa is a good choice for 3 or 4 couples looking to share in getting away from it all, or families with either young or older children. It is located in Cap Estate and has a medium-sized pool for those times when you don’t want to make the short 10-minute walk to the beach. Golf, tennis, and water sports facilities are nearby. This is a non-smoking facility with maid, gardener, and pool service Monday through Friday. You can also choose to have your meals fully catered if you wish. Be sure and try snorkeling around St. Lucia… it’s some of the best in the world. 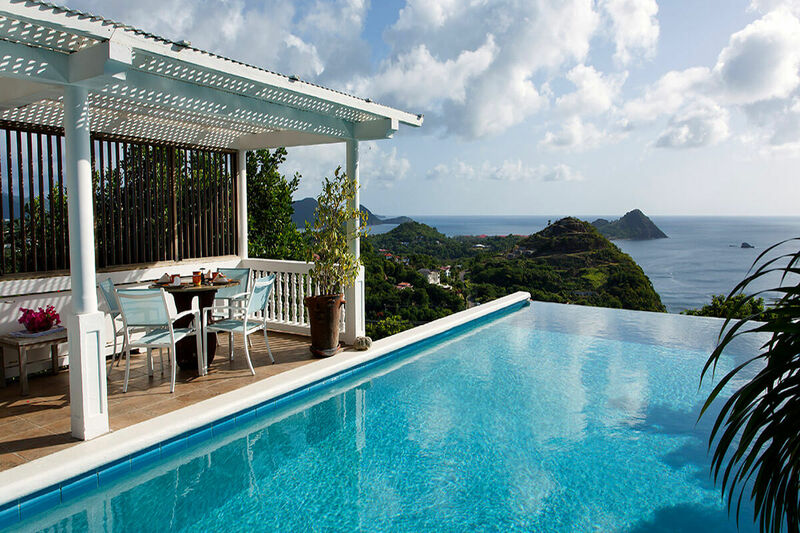 Bliss Villa in Cap Estate, St. Lucia is a five-bedroom getaway for a small group of up to 10 guests. Situated on a hillside, the views of the Caribbean and St. Lucia are long and wide, and on a clear day you can see the Pitons, St. Lucia’s twin peaks. The closest beach with great snorkeling areas is only a 10-minute walk away. Rodney Bay, which is a five-minute drive, is great for shopping, restaurants, and nightlife. The villa has a housekeeper who comes in daily and looks after guests’ needs. There is a gardener as well, who also serves as a security guard, who lives in a separate apartment on the grounds.